The New Hampshire State Quarter is the fourth state quarter issued in the year 2000 and the ninth in the series which was authorized by the 50 States Commemorative Coin Program Act. 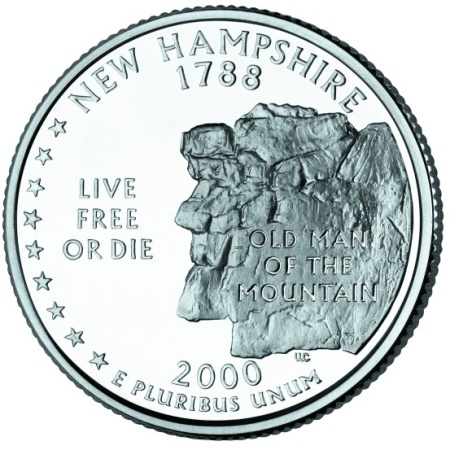 It was released on August 7, 2000 and the theme of the coin is Live Free or Die/The Old Man of the Mountain. The rock formation, "The Old Man of the Mountain"
The state motto, "Live free or die"
"The Old Man of the Mountain" was a unique rock formation on Mt. Cannon in New Hampshire that distinctly looked like an older man looking toward the east. Sadly, the formation crumbled in 2003 but it will be forever remembered on the New Hampshire State Quarter. 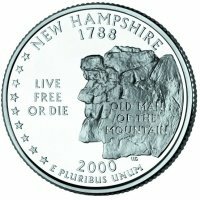 The design selection of New Hampshire's quarter began with the Governor creating a Commemorative Quarter Committee. The committee consisted of members representing the Department of Cultural Affairs, Arts Educators, Numismatics, Historical Societies, the Senate and House and New Hampshire citizens. Residents of New Hamshire then submitted design concepts to the committee from which the final design concept was chosen. Below is a table showing the design specifications and mintages of the New Hampshire State Quarter. Note: The modification moved some of the wording from the reverse to the obverse to leave the reverse available for the state's design. Reverse - Each state theme was proposed, and approved, by the governor of the state. Final design was created by William Cousins. His initials appear near the bottom of the coin just above the 'M' in E Pluribus Unum.